Everything you need to succeed… for good. You are unique and your weight loss plan should be, too. Feel rested when you wake up? Have energy to play with your kids? Fit into your clothes more comfortably? If this all sounds good, but not what you’re experiencing now, it may be that you’ve got some weight to lose. Or maybe you’ve started to lose the pounds — you’ve got a good diet and exercise program — but you’re stalled and are still unable to lose that last bit of weight. 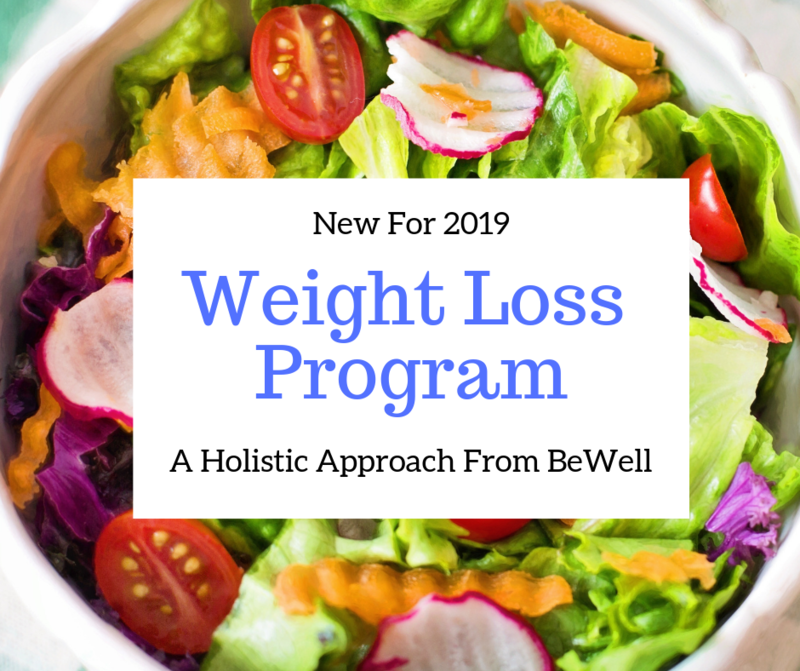 Whether you need to start losing weight or you’ve hit a plateau, the holistic Weight Loss Program from BeWell may be the answer. Most of all, Mary will be there with you every step of the way, keeping you on track, motivated, and inspired to lose those pounds. I lost 25 pounds in 2 months and I have a lot more energy! (And) my arthritis pain is better since the weight is down. I would definitely recommend the program! My family told me about it. I enjoyed the one-on-one encouragement and new menu ideas! BeWell’s Weight Loss Program is a 6-week, all natural, guided program that’s individually tailored for your needs and goals. Finally, a nutrition plan that is easy to follow! And one that will not only help you lose weight but also maintain your weight loss long after your goals have been met. Individualized Plan – Everyone is different, so your program will be different based on your age, height, weight, any blood work results, medical history, BMI, and weight loss goals. Balanced Meal Plan – You’ll get a well-balanced meal plan including protein, healthy carbohydrates, and fats, based on your lifestyle and caloric needs. FDA-approved Nutritional Supplements – We only use high quality, pure, nutritional supplements to help kick start your journey. Activity and Fitness Guidance – together, we’ll explore the many ways to incorporate movement into your everyday life. Education, Support, and Motivation – Personalized support from a highly trained professional. I highly recommend a visit with BeWell if you want to really figure out what the root of your health, pain and physical issues are. While I’m still a work in progress, [BeWell] has been instrumental in recommending changes in nutrition and lifestyle that along with a good workout program have changed my life in ways that I never felt possible. At 53, I am in better health than when I was 35 years old. I am excited to continue this journey to physical and mental wealth for the rest of my life. Thank you! This is a 6-week program consisting of a 90-minute initial consultation, and then three biweekly 30-minute meetings (in person or by phone) for program adjustments, support, accountability, and motivation with Mary Gowdy, your Certified Nutrition Specialist. Meetings are in person or by phone. There’s no right diet plan for everyone. Choose a personalized strategy devised by you and your clinical nutritionist to achieve the results you desire. Choose BeWell’s Holistic Weight Loss Package. With the Weight Loss Program from BeWell, you’ll learn how to set healthy, reasonable goals and move past the obstacles that stand in your way. You’ll learn how to get back on track with your health and back in balance with your weight. by NY Times bestselling author Danielle Walker. If purchased separately, the elements of this package would cost $650, but as a package, it’s all yours for only $497. To learn more and to determine if this program is right for you, schedule a Free 15-Minute Consultation to find out how we can help you create the healthy weight and lifestyle you desire. Please Note: This package does not include functional testing. If you and your clinician feel that testing is right for you, payment for the test and your test results appointment would be additional.